In an effort to address the high levels of crime and violence in Braamfontein, a civic campaign, Braam Safe Week, ran from August 20 to 24. Braam Safe Week was a joint initiative organised by non-profit organisation Voice it in Action (VIIA), the Braamfontein Improvement District (BRAAM) and South Point. President of VIIA, Kgothatso Moloto, believes that a safer community is possible through combined efforts. He told Wits Vuvuzela that, “The Braam Safe Week is aimed at creating a safer community through various activities and to raise awareness around issues with the general safety within the community in mind, whilst informing and empowering the community with information,” he said. Planned activities throughout the week included encouraging participants to visit and take photos at safe zones such as the Hillbrow Police Station. 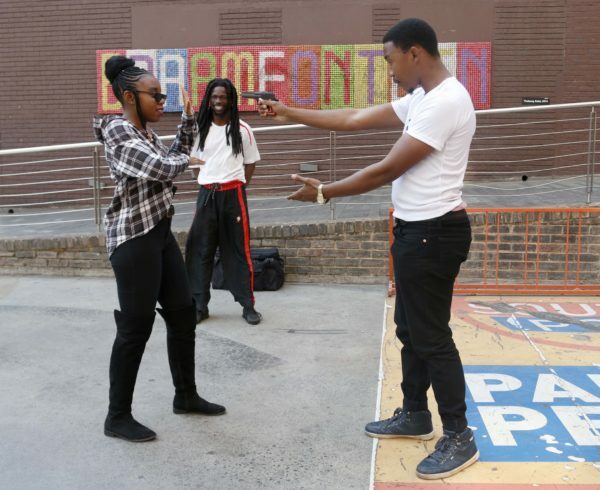 On Wednesday, self-defence classes were held at the Grove and Eland Plaza. Wits Vuvuzela attended the session at the Grove where two instructors showed interested individuals tips and tricks for defending themselves. Thando Nkosi, a first-year Public Relations student at Rosebank College, who attended the session, said, “So far it’s helpful. Braam is not safe. I think they should do a weekly session,” she said. Mthiyane said South Point was considering developing a partnership to create a calendar for next year to further educate and raise awareness around safety concerns in the community. On Friday afternoon, a march was scheduled to start at the Wits Solomon Mahlangu Entrance and end at the Hillbrow Police Station where Moloto said they intended to hand over a letter to a Brigadier Nevhuhulwi. However, whereas the organisers had hoped for 600 people to join the march, only five showed up. Moloto reflected that people were quiet, inactive and not supportive of initiatives such as this, but were very quick to complain when issues arose. “However, as an organisation we are not giving up,” he added.